First kindness is strengthened by seeing, hearing, and practicing kindness. The more our children see kindness the more it becomes contagious and something they want to be part of. Second, kind acts don’t have to cost a dime, take much time, or require any particular talent. In fact, the easier the east, the more willing kids are to practice kindness. Finally, kids must have ample opportunities and encouragement to practice kindness. When kids continue doing simple, regular kind acts, other kids will want to do the same. I’ve included 100 simple ways to help children recognize Kindness Power. Print them off and post them on your refrigerator or classroom door. Then encourage your children to add kind deeds to the list. Or even better, brainstorm your own list as a family or class. For more ideas (and the research behind Kindness), please see Chapter 6 in my latest book, UnSelfie: Why Empathetic Kids Succeed In Our All-About-Me World. And let’s start a Kindness Revolution! 1. Take treats like cookies to the fire station to let the responders know you are grateful. 2. Do a chore for someone without them asking. 3. Make a flower bouquet from your yard and bring it to someone special. 4. Talk to someone new at school. 5. Compliment or encourage someone. 6. Ask someone sitting alone to play or eat with you. 7. Write kind thoughts on the sidewalk, street or playground (ask an adult!) with sidewalk chalk. 8. Bring a batch of cookies to an inbound neighbor or friend. 9. Collect used games, books, toys to donate to a homeless shelter. 10. 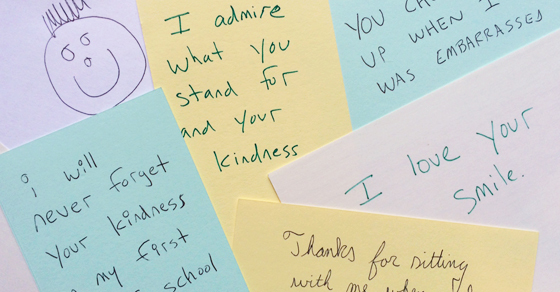 Write kind words on Post-its and leave them on lockers, walls, or on family members’ pillows. 11. Offer your parents to help make dinner. 12. Clean (dust, sweep) a room without being asking. 13. Set aside a jar to collect spare change. When filled donate it to a needy cause. 14. Put together a caroling group to sing songs or play music at a nursing home. 15. Pick up litter or trash and suggest others do the same. 16. Shovel snow, weed, or rake leaves for the elderly neighbor. 17. Pack a gently used backpack with extra stationery, crayons, markers to give to a shelter. 18. Put a box in front by your mailbox (or school door) and ask for book donations to give to the library or to a shelter. 19. Make a homemade gift for someone deserving. 20. Make activity bags (puzzles, crayons, toys) and donate them to Toys for Tots or fire station. 21. Set up a stand to sell lemonade or homemade cookies and give the proceeds to a charity. 22. Call or visit a lonely or sick friend. 23. Leave a thank you note for someone deserving. 24. Smile at five people. 25. Say hello, wave or share something. 27. Open the door for someone. 28. Wave and smile to two new people each day. Then go for three – four – five. Challenge yourself to see how many new people you can smile at. 29. Read a book to your brother or sister or anyone. 30. Give a compliment to a different person each day for a month. 31. Congratulate or give a high five to a deserving person. 32. Hug your mom or dad (and then do it again and again). 33. Give someone a “Have a Good Day” text or note. 34. Email an inspiring news story about someone doing something kind for others. 35. Help young younger brother or sister with homework or anything they need help with. 36. Plant a tree or pull weeds to beautify an area. 37. What’s your talent? Teach someone something new. 38. Write a kind note and hide it in someone’s lunch. 39. Help someone unload groceries at the store – or hold the door open for them. 40. Make play dough for a preschool class and deliver in baggies. 41. Wave and say thank you to the doorman, crossing guard, postman, policeman, principal or whoever else deserves thanks or a happy greeting. 42. Create a centerpiece for your table: string paper hearts from a tree branch decorated with markers, glitter). You can also add kind statements to each. 43. Invite your family or friends to watch a movie about kindness: Dumbo, Charlotte’s Web, Pay It Forward. 44. Be a Secret Kindness Pal: everyday for a week leave a kind note on a different family member’s bed or friend’s desk. 45. Let someone go in front of you in line. 46. Call your grandmother or grandfather or aunt or uncle. 47. Hold the door for someone. 48. Leave your spare change in the vending machine (or tape it to the parking meter). 49. Say please, thank you or excuse me. 50. Offer to take your neighbor’s dog for a walk (or your own). 51. Organize the clothes you don’t wear and put them in a box to donate. 52. Check the paper for a local 5k or 10k Charity Run and then sign up. 53. Check out DoSomething.org for a cause that matters to you. 54. Stand up and speak out for someone treated unfairly. 55. Say good morning to your parents, neighbors, siblings, principal, teacher, bus drivers, secretary. 56. Give up your seat on the bus, park bench, subway, train for someone who looks tired. 57. Volunteer to help at a school or community event. 58. Write a letter to a deployed solider through Operation Gratitude. 59. Go online to www.nicethingstodo.net. It offers ways to donate or help others. Find one! 60. Volunteer at any kind of shelter or food bank in your community. 61. Listen to someone who looks stressed or sad or overwhelmed. Ask how you can help. 61. Find someone you don’t know and introduce yourself. 62. Write a get well card for someone in the hospital or to someone you know. 64. Tell someone deserving why they are special or important to you. Be specific. 65. Start a Pay It Forward tweet. Tweet something kind and suggest others pass it on. 66. Leave a “thank you” note in your mailbox for the postman. 67. Surprise a friend with a small homemade or inexpensive gift. 68. Leave an anonymous kind note in a library book for someone to find and enjoy. 69. Tell three people you look up to why you admire them or think they’re special. 70. Offer to babysit for your parents, the neighbors or your friend’s parents. 71. Leave a positive sticky note on your parent’s bathroom or car mirror. 72. Feed the birds or make an easy bird feeder to put in your yard. 73. Offer to help someone who is struggling with homework. 74. Make sandwiches to give to a homeless person. 75. Make a birthday box for a child with items like a cake mix, a birthday card. party hats, poppers. candles, and deliver it to the fire state or local food shelter so someone can celebrate. 76. Make a kindness calendar: on a monthly calendar and then write kind thoughts or wishes for everyday on the next month. 77. Donate old blankets or dog toys to the local animal shelter. 78. Make kindness cards on construction paper (decorate with glitter, marking pens) or from your computer and deliver them to a senior center or hospital ward to add a little cheer. 79. Send an apple to your teacher with a note as to why you appreciate her or him. 80. Write a thank you to your parents and leave it on their pillow. 81. Leave a note complimenting someone you know on the windshield their parked car. 82. Smile at five people, or ten or 25. Or challenge yourself to smile at one new person every day for a month. 83. Leave a flower on the neighbor’s doorstep or teacher’s desk or parent’s pillow or anyone else who deserves your gratitude. 84. Help coach a young child in your favorite sport. 85. Start a food drive at your parents’ workplace or in your community. Ask other kids to help you fill a box with canned goods and bring to a shelter, Fire Department, church, police department to distribute. 86. Put together a walk-a-thon or read-a-thon with your friends and donate the proceeds to a local charity. 87. Look for articles in your newspaper or online of ordinary kids who are doing extraordinary things and share them with your family or friends. 90. Send a care package to a solider. Even better, get a few friends to help and each of you send a package to a solider. Body wash, chap sticks, foot powder, face wipes, Q-tips, magazines, and homemade cards are always appreciated. See Support Our Troops. 92. Greet your neighbors with a smile, wave, or big hello when you see them. 93. Does someone need help like-their backpack is unzipped, locker left open, papers on the ground, shoe untied-then offer to help. 94. Wave to kids and smile as they drive by on a their bikes, in cars or school bus. 95. Write kind words on rocks and leave them in your backyard, park or playground. 96. Start a Kindness Jar in your home by writing compliments or happy memories on slips of paper and encourage others to do the same. 97. Make an effort to count to 10 or take slow deep breaths when you start to get angry. 99. Use your allowance to shop at the dollar store for puzzles, crayons, and coloring books to give a needy family or shelter. 100. Remember to be kind to yourself so you can be kind to others! Michele Borba, Ed.D. is an internationally renowned consultant, educational psychologist and recipient of the National Educator Award who has presented workshops to over a million participants worldwide. She is a recognized expert in parenting, bullying, youth violence, and character development and author of 22 books including UnSelfie: Why Empathetic Kids Succeed in Our All-About Me World, The 6Rs of Bullying Prevention: Best Proven Practices to Combat Cruelty and Build Respect,The Big Book of Parenting Solutions, and Building Moral Intelligence. She has appeared over 130 times on the TODAY show and is a frequent expert on national media including Dateline, The View, Dr. Oz, Anderson Cooper, CNN, Dr. Drew, and Dr. Phil. 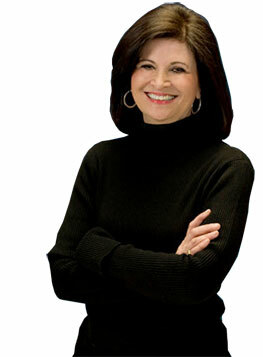 To book her for speaking or media even refer to her website: www.micheleborba.com. Follow her on twitter @MicheleBorba. Contact us at 515-271-1910 or RayCenter@Drake.edu for assistance with your character development and leadership programs. Copyright © 2019 The Robert D. and Billie Ray Center. Powered by WordPress. Theme: Spacious by ThemeGrill.